Sign up now for instant + lifetime access! The online French Cooking Academy by Virginie C. is a unique online French cooking course for home-cooks who want to learn the basics of French cooking, and desire to live a gourmet lifestyle "à la française". It's all about how to cook real and healthy French meals with real ingredients in a modern way, and how to live the "joie de vivre" à la française. Don't miss out this unique and fun way to hone your French cooking skills without leaving your kitchen! There are hundreds of hours of workshops. You'll be able to learn at your own pace from anywhere. "The French Cooking Academy is an excellent program — definitely worth checking out! It offered much more for me than any Youtube cooking videos. It was worth to pay a chef to help me instead of trying to figuring stuffs out online by myself. With this course I learned a tons of tricks and feel more confident knowing that top French chefs use the same way. Prepare delicious macarons, crème brûlée, onion soup or beef stew with ease. Learn the exact techniques - adapted to the home cook - top French chefs use? Impress your family and friends with a simple, yet luxurious French meal? Be the woman/man who knows how to attract The one with a great meal? HINT: there's a new way. you don't need to drive to a cooking class, or waist your time on YouTube. Time have changed!The time is over when you had to try it out all alone in your kitchen or drive to a cooking class. "Bonjour! My name is Virginie and I've had the privilege to cook real food in my kitchen for more than 15 years and learn the basics of French cooking from top French chefs while attending a French culinary school in Toulouse, France. I eat healthy food every day and have the freedom to cook what I desire, whenever I want. But it was not always like this." I know that feeling of not knowing where to start and feeling lost in the kitchen with hundreds of recipes, but not really having the freedom to cook any recipe, because I was in that same situation not so long ago! I struggled with my recipes and it took forever to prepare a meal. I ended up frustrated or not cooking at all, spending a lot of money on processed food or delivery services. IT WASN'T UNTIL I LEARNED HOW TO MASTER THE BASICS OF FRENCH COOKING THAT I WAS FINALY ABLE TO BECOME MORE CONFIDENT AND CREATE EASY AND UNFORGETTABLE FRENCH MEALS. Now I eat healthy food everyday, prepare any recipe with ease because I know THE right thing to do and WHY I do it. I have my 6-years old little girl and my husband begging me for a homemade French split pea soup or homemade macarons and madeleines. My daughter is regularly saying "umm it smells so good, maman...can I try?". Taking a little time to cook something from scratch with real food is my way to make the love I have for my family and food become visible, sometimes I cook with my daughter, with my husband, then we share our flavorful meals together. ARE YOU READY TO COOK FRENCH CUISINE AND START ENJOYING THE FRENCH GOURMET LIFESTYLE NOW? You want to learn more about French cuisine and introduce it to your weekly menus. You want to add new recipes to your recipe box. You love to cook and are always looking to learn new techniques and skills. Your husband is French and you want to prepare him his favorite French dish. You're a French expat living abroad and you're missing real homemade French cuisine. You are a beginner cook and you want to take your culinary skills to the next level, but you don't feel like going to or don't have time to drive to a cooking class. You feel tired of wasting your time on Youtube, looking for recipes and cooking techniques, and you're not sure if it's going to work. You think it takes too much time to cook something really good, I mean French cuisine ;). French cuisine can be prepared fast when you know what to do. You want to eat healthy, real and fresh food, but you have no idea how to do it. YOU love French cuisine or you are eager to learn. YOU want to bring passion back in your life. I will help you master the basics of French cooking and show you how to enjoy the French "joie de vivre". Planning week-night dinners should not be boring, neither stressful. Bonjour! I'm Virginie, modern French cooking & success coach living in French Riviera. I am also a mom of a 7-year old little gourmette girl, a home chef, lover of fine wines and jazz music. I'm a trained chef with a background in chemistry and wine tasting. I'm here to inspire and help YOU, the passionate or aspiring home-cook to take action and cook easy, but unforgettable French meals. Bienvenue to The online French Cooking Academy by Virginie C.
Bravo! You are officially a French home chef! You will also have access to my online course and ebook below. There won't be a list of random tips, ideas or general information. You're going to receive original and specific advices and directions from my own personal experience as a mom and French trained Chef who grew up with the best cooks in the world, my French Grand-ma Cécile and Eugénie. This program is for everyone who has an interest OR wants to learn French cuisine, whether amateurs or with a little experience. If you've never tried French recipes OR if you tried a bunch of French recipes and it did NOT work out great, than this program is going to be great for you. The curriculum has been designed to teach you step-by-step how to master the BASIC skills and techniques to bring you from home-cook to home-chef in a short amount of time. I want to join, what do I have to do? The process is simple: Join today by clicking the pink "enroll" button . Then you'll receive access to all the workshops right away. How long do I have access to this service? You will have LIFETIME access to the online French Cooking Academy content, workshops, documents, and resources. 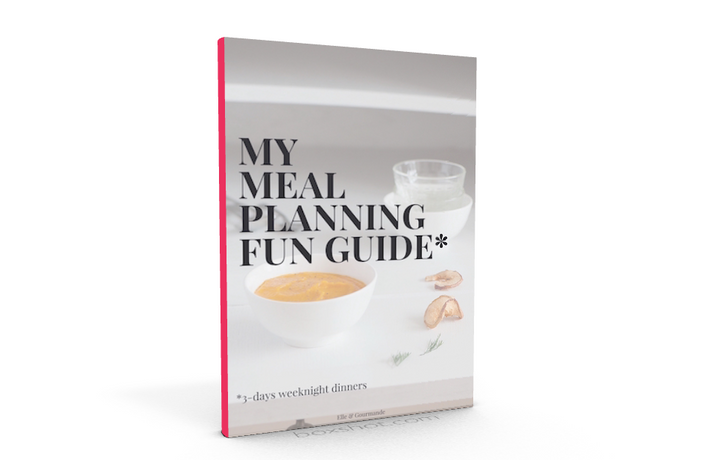 [BONUSES: Your First 3-course Menu Course and My Meal planning guide have also a lifetime access] - across any and all devices you own. We do not offer cancellations or refunds. And because the courses are accessible at the time of purchase, and the ebooks are downloadable at the time of purchase, we do not offer refunds or cancellations. All purchases are binding.